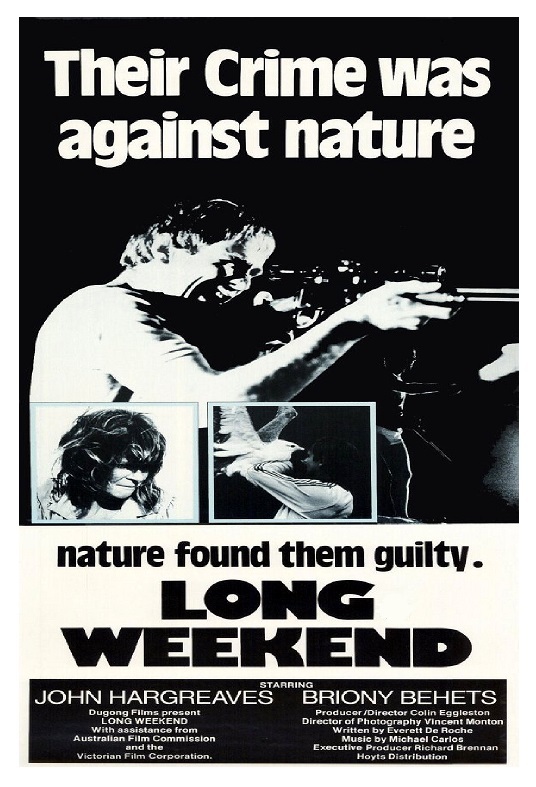 For those of you who thought the ecological terror that was promised in The Happening is worth another whirl, gaze your eyes backwards and discover the unsettling Australian chiller Long Weekend. The score is a discordant composition that could’ve been meant for a Wes Craven slasher. To note, the wildlife photography is sprawling and sumptuous (the ant-swarm footage is the best since Phase IV) and Vincent Monton’s lensing is a divine gloss over the nightmarish story. Animals and the outdoor elements surround a squabbling couple who are in the middle of a relationship crisis and determine that a camping trip will be the cure. At first, Marcia is such a shrew that the audience can’t be blamed for empathizing with Peter’s passive alienation from her. She critiques how he changes the radio station, how he proposes an early start for their vacation and she snaps at him for asking questions. This Outback thriller is built on a domino effect in which Peter’s lit cigarette is flicked out of a window and begins a brush fire. Shortly thereafter, he tragically decimates a kangaroo with his vehicle whilst driving. Later, Marcia sprays insecticide on their picnic. From there, the film metamorphoses from domestic turmoil to feral reprisal from the critters. Of course, their dog, Cricket, instinctively mewls and groans. He’s undeniably the smartest character in the film. When interviewed about the origins, screenwriter Everett De Roche basically extemporized the story within 10 days and his only bulwark was to write an environmental horror movie. Uprooted from their troubles at home, Peter and Marcia (no relation to the Brady Bunch) rekindle their fledgling romance. De Roche’s mandate was that the creatures look cuddly and harmless. After all, eagles are majestic, gliding creatures. No one could imagine them desperately clawing and nibbling someone, right? Just from an admiration of animal wrangling, the film is a marvel of choreography as the aforementioned eagle and a sneaky possum gnashing on their food react perfectly to the stimuli around them. What’s uncanny is how we initially engender sympathy for Peter and Marcia. Then, halfway through the film, that sentiment erodes and we view them as the antagonists as if it from nature’s vantage point. Their angles are askew and they are seen in only the worst possible light as stark-raving villains. Peter’s percussive, gratuitous shooting at the chirruping birds is a one-dimensional demonization that the animals share of this interloper. Sound design plays an integral component to the paranoia-tinged climax. Peter is engulfed by the ambient noise of screeching birds, rustling leaves and possibly rattling snakes. It’s an acrimonious siege movie where the ugly-tourist stereotype is in human form and punished forthright.